Comments posted on the FS Managed Accounts website have been moderated. The aim of the comments function is to encourage open discourse and engagement with issues affecting the industry and is not intended to provide a forum for the airing of personal grievances. Comments should focus on the content of the news story, not the person or organisation quoted as making the comments or the author of the item. Comments that are of a personal nature, discriminatory, potentially defamatory, containing abusive language or that are excessively political will not be published. People who wish to post such comments should use alternative social media channels. Comments should not be longer than 500 words. 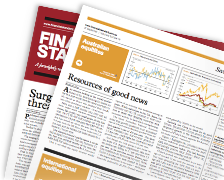 While the FS Managed Accounts aims to provide balanced coverage of issues, this is a public discussion space reflecting the views of its participants and, occasionally, one side of the debate may dominate views expressed here. FS Managed Accounts reserves the right to reject comments of a repetitive nature. It also reserves the right to reject contributions from participants who seek to dominate the discussion. Contributions that endorse commercial products or activities or solicit business will not be accepted by FS Managed Accounts for publication though the FS Managed Accounts advertising department will be delighted to discuss with such readers how we may be able to help promote those products. Some comments may be edited for clarity or to remove content that Financial Standard considers inappropriate. FS Managed Accounts reserves the right to archive and re-publish contributions sent to this discussion space. Readers who believe a comment is inappropriate should contact the editor immediately.